Did you know that sometimes Super Heroes are gluten-free? A new super hero named Violet totes around a copy of Do Super Heroes Have Teddy Bears? throughout this new Cheerios commercial. Do Princesses Wear Hiking Boots? comes to life, pixar-style. Daisy crown, can-do spirit, and all. Oh my goodness. After tireless work by illustrator, Mike Gordon and Screaming Pixels animator, Keith English, here debuts a 45 second clip of Do Princesses Get Butterflies? Turn up your speakers! When completed, this 2016 film festival short will be approx 7-10 minutes long! 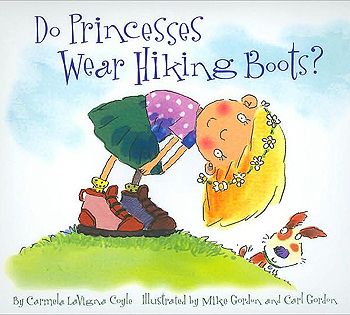 Bring Do Princesses Wear Hiking Boots to your classroom with top-notch lesson plans and exceedingly fun activities created by Marcie Colleen. All the major subject areas are covered; ELA, math, social studies, science, history, plus more. All for FREE! There's no better time than RIGHT NOW to scoot outside for some sun and fresh air. Grab a coat or sweater and some shoes (maybe a hat too) and join 1000 Hours Outside Challenge. Read 100 fantastic reasons to spend more time outdoors here!! Are 1000 hours too much of a commitment? Then how about Hike It Baby's 30 Challenge. Way cool organization, with local Hike It Baby groups all over the USA and Canada. Site design © & maintenance by xuni.com. All content © 2012-2019, Carmela Coyle.